I well remember one night, laying in bed with the lass that I used to live with, when she put her arm across me and said, "are you getting a paunch?" I was mortified! 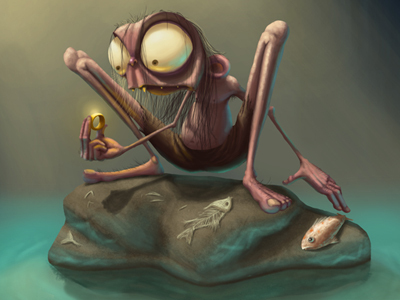 I was only thirty, I still remember it vividly. Now, I've never been to a gym in my life but I used to have a six pack (abs, not beers) just through having a physically demanding job. I used to have decent arm and leg muscles too. Sun's out, gun's out! 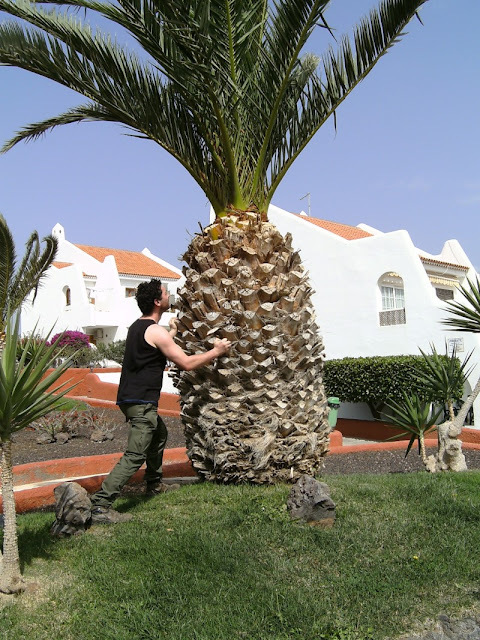 Me wrestling a giant pineapple on Tenerife in 2008. Fast forward a few too many years and I now have a cushty job where I rarely need to flex a muscle or break a sweat, though sadly I certainly do break sweat quite often. My internal thermostat is basically shot, has been for several years now. Anything over 16 degrees and I sweat! I've decided that I need to be more active than I currently am, my nickname (Walkabout, not The Gibster) is a bit of a joke nowadays. On Monday I walked across to The Quiraing and back, a tidy 14 miles - give or take a few hundred metres. The following day I wandered down to the shop, through the woods, down to the pier and back, up the Chasm of Doom, through the cemetery and back down to the hotel (approx three and a half miles). Today I was on a training course, so spent the day essentially immobile, sat on my arse trying to fit in with the crowd. But afterwards I wandered down to the pier and back, racking up another three miles. That amounts to around about 20 miles walked in the last three days. I have it in mind that I ought to do one decently long walk per week and that I should be marching myself down to the pier and back on a daily basis. It's a modest start, but if I do a ten mile walk once a week, and visit the pier daily, that should add up to around about 30 miles a week. Not enough! I'm gonna aim at 35 miles per week, that's not including any of this shite 10,000 steps a day nonsense that folks go on about, just by wearing a watch on their wrist. You could rack up just by bumbling around the house all day. No, I mean 35 miles worth of walking. Last summer I did my pier march before and after work, so that's six miles without counting all of my 'incidental steps' throughout the day. If I do that 5 days a week, plus my long walk, I'll be topping forty miles walking per week. That's quite a lot! So saying, I was doing that every two days back when I walked Land's End to John O'Groats - and that was with tent, clothes, bedding, food, water, maps and cooking gear on my back. Mind you, I lost over two stone in the process...! I have to 'fess up, even though I've been moderately repulsed at the sight of my own body for quite a wee while now, a lot of the impetus for this change has come through reading the brilliant DMC Journal, so hat's off to you buddy, for the push to make a change in my lifestyle. Best I could do at short notice! Thank you Seth for the very unexpected mention. On the health front I've lost a stone and 3" off the waistline in the last 5 weeks and done a whole lot of walking after giving up smoking and I can't believe how much better I feel. Got to say that the number of miles you're talking about puts me to shame though. I must try harder. Yep, I'm still alive out here!